Dutch Finance Minister and Eurogroup president Jeroen Dijsselbloem said Athens will remain under supervision even after it exits the bailout. ATHENS - Greece will remain under supervision after it exits its current bailout and Athens must achieve "economic and political stability," the head of a group of Eurozone finance ministers said Saturday. 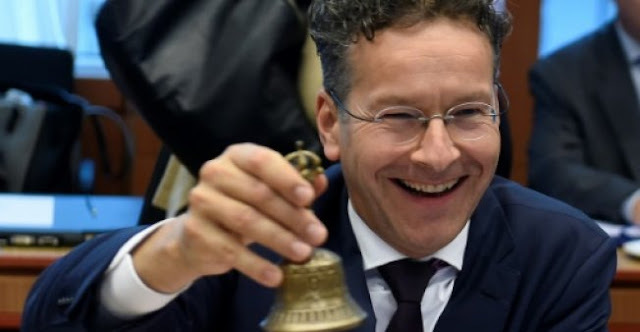 "The viability of Greek public debt (179 percent of GDP) will be reviewed at the end of the programme if Greece respects its commitments," Dutch Finance Minister Jeroen Dijsselbloem told the Ta Nea newspaper in an interview. "In all cases where we have had support programmes, the countries have had to submit to a programme of supervision after it ended as happened in Ireland, Spain or Cyprus," he said. "In Greece we will also have a supervision programme especially since there are outstanding debts with long repayments." But he said the Greek economy "is performing better". Earlier this month, Greek Prime Minister Alexis Tsipras said the country's Grexit status had changed and it was now attracting investors in droves. "In 2016, direct foreign investments were the highest in the last 10 years and in 2017 further improvement is expected," Tsipras said. Dijsselbloem is expected in Athens on Monday to meet Greek officials, including President Prokopis Pavlopoulos, Prime Minister Tsipras and Finance Minister Euclid Tsakalotos. Two years after Tsipras's leftist government nearly crashed Greece out of the euro, and eight years after the country plunged into economic crisis, employment numbers are finally improving. Tsipras added his administration has created around 500,000 jobs since taking over in 2015 -- "a record for the last 16 years" -- and expects the economy to grow by nearly 2.0 percent this year. Greece will remain under supervision after it exits its current bailout and Athens must achieve "economic and political stability," the head of a group of Eurozone finance ministers said Saturday.